We've started a tradition at our house to make doughnuts around Halloween time. I figure what's a little more sugar and fat at Halloween, right? These doughnuts are delicious. And easy. And pretty fast to make. And the kids love helping make them. And they disappear pretty fast. 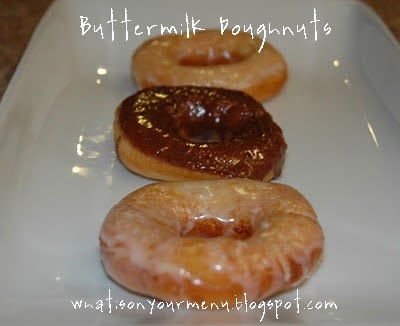 Want to make some doughnuts of your own? Find the recipe here. Your family will love you even more. Here's a few pictures of this year's annual doughnut making night. My oldest two kids were in charge of dipping the doughnuts into the glazes. They called it "being in charge of their stations." They did a great job. Then we got to eat them. And a vanilla glazed...I think vanilla is my favorite this year. The kids each got to take a doughnut in their lunch yesterday. Best dessert ever! "I'll take one more, Mom." To busy eating to give a thumbs up! What are some of your Halloween traditions? Hope you're having a fun "Halloween week" (it actually seems like "Halloween month", doesn't it? ).